Board certified orthodontist Dr. Robert Becker is devoted to creating your beautiful smile! He absolutely loves his career choice and the lifelong relationships he has formed with his patients. 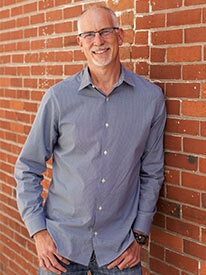 Dr. Becker received his Bachelor of Arts degree in biology from the University of Missouri, Columbia in 1987. He continued his education at the University of Missouri, Kansas City School of Dentistry, graduating with distinction in 1991. He received his Master of Science in Dentistry degree and Certificate in Orthodontics in 1994, graduating with honors from the Indiana University School of Dentistry. Dr. Becker has been active on various community boards, is a member of Leadership Springfield Class XIV, and was recognized by the Springfield Business Journal with the “40 Under 40” Award in 2002. Dr. Becker is active in his church and the Boy Scouts of America. Dr. Becker’s wife, Julie, is a graduate of Kickapoo High School (1984), and she is an oral and maxillofacial surgeon in Springfield. They have three children: Olivia, Samuel and Ethan. They enjoy spending time as a family doing various outdoor activities.